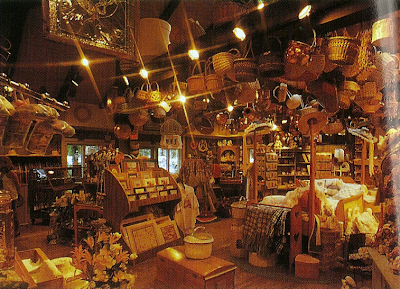 Let's take a quick trip back in time to visit one of the Village's many distinct shops: the Great Southern Craft Company. You can picture the scene: a peaceful blue spring morning in Lake Buena Vista. Near the Captain's Tower, flowers are arrayed on steps leading to the reflection pond. The only sound is that of the lagoon's waves gently lapping the dock from a passing boater. 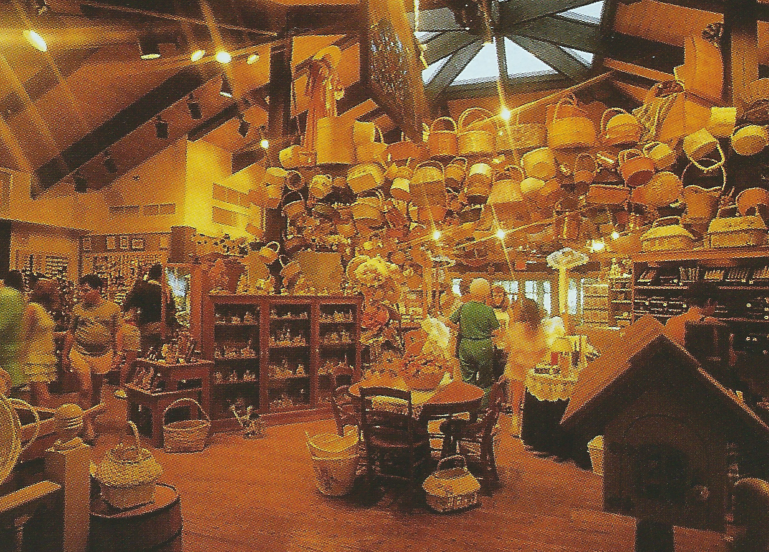 Around the side of the Cane, Rattan, Wicker & Suns shop, sandwiched between it and the Toledo Arts spanish antiques store, is the shopper's mecca for anybody at Walt Disney World who needed to buy a basket - the Southern Craft Company itself. A brief word about the Craft Company. It opened in 1977 or early 1978, and replaced one of the Village's earliest disappearances, along with the Collonadde des Artes: Von Otto's Antiques. In contrast to the Magic Kingdom's antique shop, Von Otto's store was neither as artfully cluttered nor as interesting, but the name of his shop was printed on a coffee grinder (!). Nobody knows what happened to Von Otto or his antiques, but the Craft Company did stay in business for almost twenty years. Those familiar with the Downtown Disney Marketplace today may have trouble placing this structure on account of her shaded veranda; this space is currently occupied by the Marketplace Guest Relations. 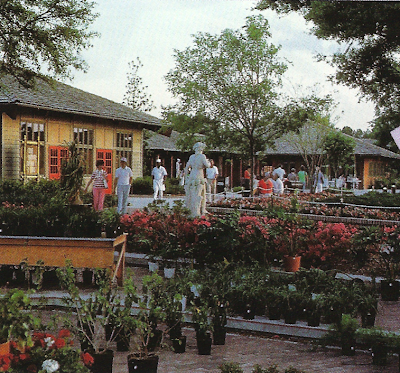 Disney cut off the veranda in the mid 1990's, when she was removing all of the Village's original breezeways, terraces and porches. One of the decorative medterranian statues which once littered the Village is visible in front of the Craft Company. 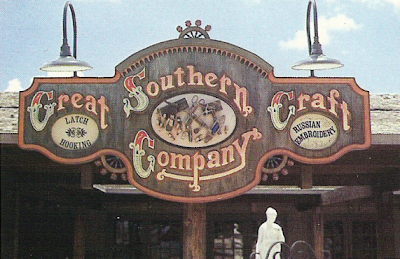 As you can see, nobody had anything on the Southern Craft Company for clutter. 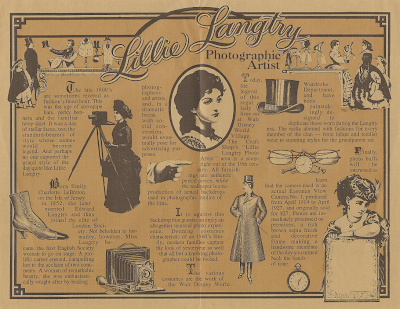 A 1981 Village guidemap boasts of the Craft Company's "assortment of kits and supplies for quilting, macrame, latch hook and needlepoint; leathersmith and silversmith; a variety of other handmade crafts; plus Lillie Langtry's old-fashioned photo studio". And yes, that's right, for many years Village guests could get their old-timey photo taken here, just like in the hospitality house on Main Street. Except instead of a Polariod 8 1/2 x 11 camera, Lillie Langtry used a real antique camera and setting. a 1980 brochure - enlarge for details! In the late 1980's or early 1990's, the Southern Craft Company moved a few yards West, occupying the space which originally housed 2R's - Read'n & Rite'n, on the endcap of that building. Here is a picture taken in that second location, where once again baskets and stained glass are on display, this time in a more open and bright environment with a memorable skylight and central wooden crossbeams. 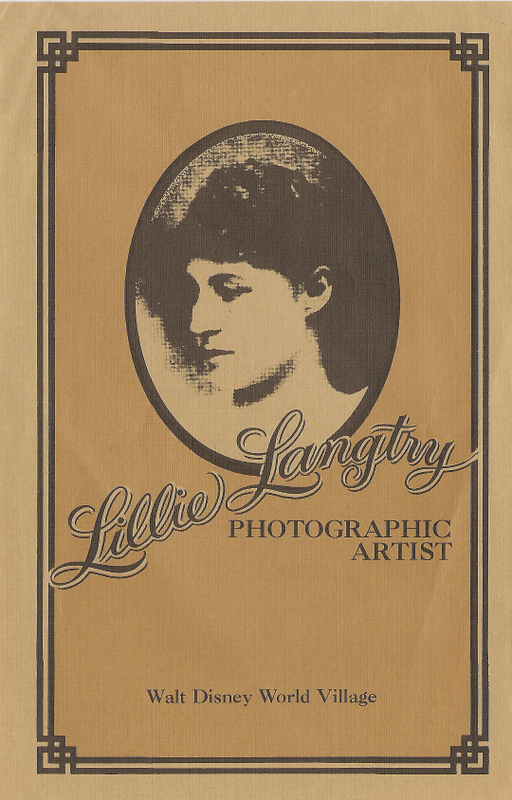 Lillie Langtry failed to make the migration. By the mid-1990's, the Southern Craft Company was gone and the space housed a number of temporary tenants, including Discover, one of those "conservation" themed stores that were popular in the 1990's. In 1996, Basin, a London-based specialty soap company, moved into this second Craft Company location and has remained for the last 14 years. The skylight and central wooden crossbeams from which baskets once hung can still be observed today. Where do you see that Basin is London-based? 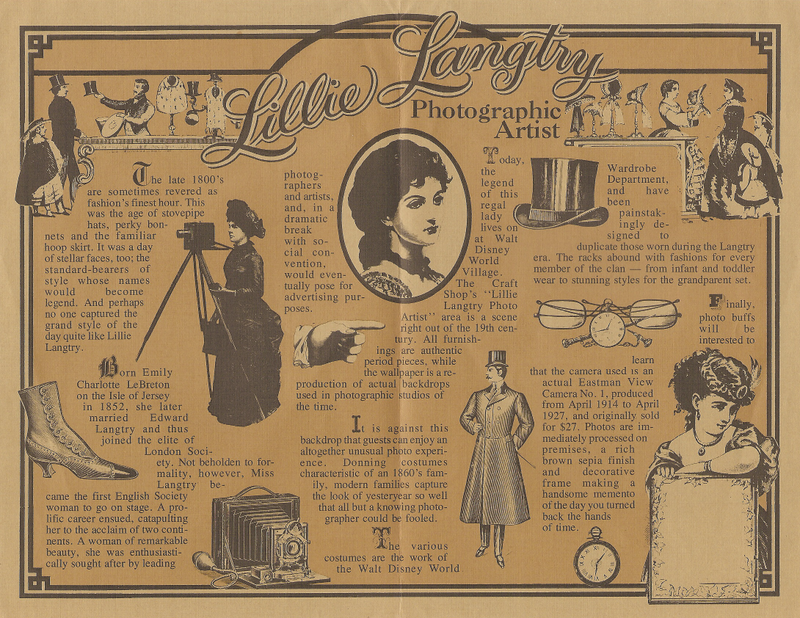 I haven't had much luck finding anything about the history of the company. I can't imagine how long it took to score some of those images. This post just blew my mind. What a wonderful mystical place that I would love to visit. That sign is pure magic and then the beautiful clutter. I mean it was so real, so grainy. Spectacular. 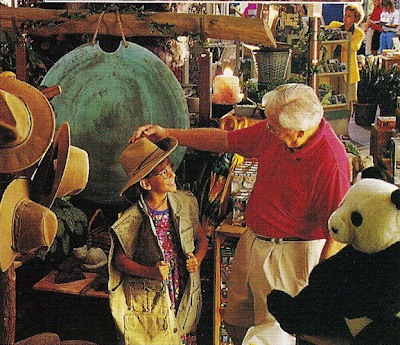 The village was really something to see, an attraction of itself unlike Downtown Disney now. Something else that I find amazing is that Basin even though it's a stupid soap store still feels special and its the ambience of the lights and the beams. Positively spectacular work FoxFurr. Thankful to have a wonderful resource like Passport 2 Dream to uncover the Disney I never knew and had never heard of or thought about. I can't even recall but I'm 100% sure that Basin is based in London. I've been shopping there for years and I know I read this on some in store printed material years ago. Yeah, Downtown Disney really blows for atmosphere these days compared to the rich autumnal hues of the Village. It was built to take advantage of that remarkable natural asset: a Florida sunset, and all of the shops were built so that rich warm light could flood in at all times of the day. Though Basin may not be much of an attraction I love their soap and the fact that their location is pretty much the only untouched Village interior left. She's very much in the spirit of the Village, with her non-Disney branded products presented in an upscale but intimate and novel fashion. In fact, soap stores have been a part of the Village since very near the very start: in the early days there was a specialty scented soap store near the Craft Company called Sachet In. I wonder if they could have fit any more baskets in there. Loved this series of articles on the Walt Disney World Village Marketplace. I remember thinking as a kid how there was absolutely nothing there that you'd ever want to buy. It didn't stop me from loving it. Later on, I worked at the Disney Village Resort (sadly defunct) and got a chance to work at the marina renting out water sprites. Great memories of a better time! Many thanks. I used to spend too much time at Disney. Now I spend too much time writing about it.